Help stimulate the economy and Employ The Rain! Based in Baltimore Maryland, Employ The Rain (ETR) is a full service Rain Barrel company specializing in re-manufacturing, installation and service of Rain Barrels and Rain Harvesting Systems. Our mission is to outfit every home, business, community garden, swimming pool and park with an affordable eco-friendly rain barrel system. Thus, our product line consists of industrial food-grade to rustic oak rain barrels. 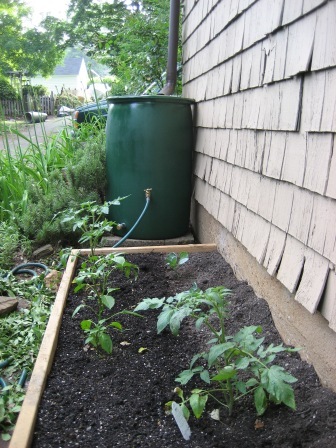 If you would like to learn more about the benefits of owning a Rain Barrel then Employ The Link. This is our first year of operation and we’re looking forward to servicing your rain barrel needs for many years to come! 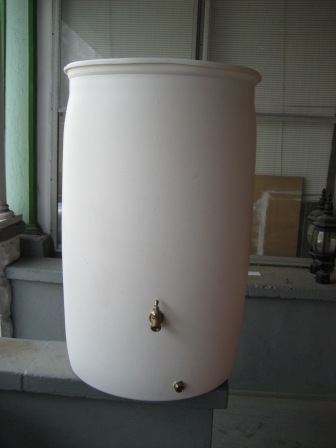 We use the term “re-manufactured” because the Rain Barrels are made from recycled plastic drums or whiskey barrels. In an effort to reduce the environmental impact in the remanufacturing process, the supplies are purchased from local hardware stores within walking distance from the ETR shop. In addition, the whiskey barrels are “ship-pooled” to Baltimore via an online shipping network. In other words, the barrels are picked up along a pre-established shipping route and combined with other commodities to fill the truck to full capacity. It is much like sharing a cab with a drinking buddy to reduce cost and CO2 emissions. 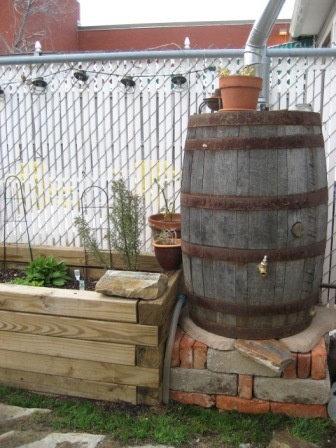 Employ The Rain professionally installs Rain Barrels using recycled goods. This process provides a variety of materials to match the aesthetics or landscape architecture of your home. If you would like to donate unwanted or used stones, gutters, hose bibs, barrels, etc. to ETR please to arrange pick-up. In addition to the re-manufacturing and installation of the Rain Barrels, Employ The Rain will come out and service your existing Rain Barrel. The service call will include a cleaning of the Rain Barrel and make sure it is operating correctly. Employ The Rain strives to provide prompt response time, great communication and quality work. To read more about ETR’s Products and Services Employ The Link. Mark Lutz, founder of Employ The Rain, has always worked in a customer service driven industry and knows how to make his clients happy.